“Which is the wiser here?” asks Escalus, the Duke’s put-upon adviser in Measure for Measure. “Justice or Iniquity?” It’s a question that Shakespeare’s famously problematic play is constantly asking us. At its centre is a thorny moral dilemma, but often it’s the sinning and corrupt who seem to have the most fun. Is it better to uphold honour and ethics or to grab hold of life’s more earthly pleasures while we can? And in performance, where does the emphasis fall? On solemn debates about justice and morality, or on the lechery that the play’s authorities try and fail to stamp out? For the most part, Dominic Dromgoole’s production takes the side of debauchery. Even before the play has begun, we’re immersed in a loud, bawdy version of Shakespeare’s Vienna, brimming with colour and sin. This is the liberal, licentious society that the Duke is about to take leave of, shirking the challenge of tightening the law’s reins. Instead, that’s the task of his unforgiving deputy Angelo, left in charge in the Duke’s absence. But Angelo’s crackdown is complicated when the pleas of nun-in-training Isabella, whose brother Claudio has been sentenced to death, are more persuasive than she intends. Faced with temptation, the question falls to Angelo: justice or iniquity? As a debate on justice, mercy and hypocrisy, Measure for Measure is intellectually and rhetorically rich. To be more than a dramatised essay, though, it needs an injection of theatricality, which Dromgoole finds in Vienna’s less exalted citizens. There’s a delicious – if occasionally overstated – excess to the performances of Petra Massey as brothel owner Mistress Overdone and Brendan O’Hea as her unscrupulous client Lucio, who alongside Trevor Fox’s pragmatic pimp Pompey laugh their way around the newly harsh (and, in the case of Dean Nolan’s clowning constable Elbow, fumbling) law enforcement. The plot’s creaky moments – the willingness of Mariana to leap into bed with the fiancé who jilted her; the convenient offstage death of a pirate who looks remarkably like Claudio – are likewise overcome with Blackadder-esque comic flourish, never pausing over inconsistencies. There are some darker shades, as women are dragged protesting from the streets between scenes, but on the whole this is a remarkably light Measure for Measure, not dwelling on the threats of death and damnation. The scales, the crucifix and the skull, gathered in small tableaux at the far end of Jonathan Fensom’s simple design, remain in the background. But there’s nothing simple about the characters here. Angelo is no straightforwardly pompous, hypocritical Puritan, and Isabella is far from a saint. As the righteous man undone by desire, Kurt Egyiawan is hard to pin down. At first, his sudden lust for Isabella visibly overwhelms him, but the icy resolve shown in earlier scenes creeps back over him as he covers his tracks. As his unwitting tempter, Mariah Gale’s Isabella is earnest in her protection of her virtue, yet odd moments betray an underlying passion and pride. And then there’s the Duke, a puppeteer with murky motivations for pulling the strings. It’s a puzzle of a role for any actor. Is this leader a would-be God, testing his subjects while he looks on, or simply a master manipulator out to get what he wants? Dominic Rowan plays him awkward and uncertain, making it up as he goes along, until in the convoluted final scene he steps back into the robes of power with a little too much relish. There might be no revelation at the heart of Dromgoole’s interpretation, but this is a Measure for Measure that keeps its setting in mind. 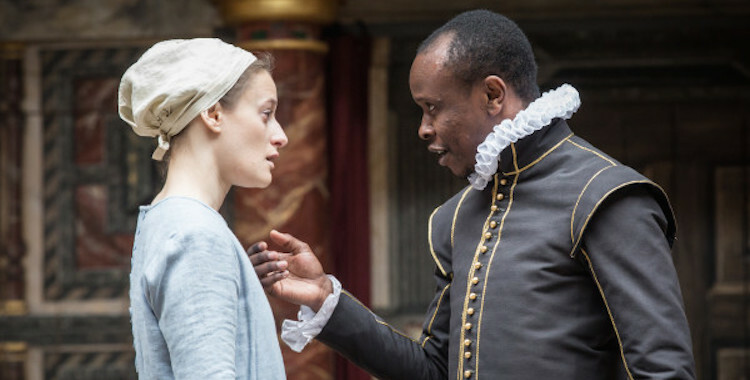 The Globe is about the groundlings, and this version of the play is about the people – flawed, passionate, pragmatic – who populate it. The problem posed by the play is never quite solved, but it certainly revels in the attempt.